Dr. Cohen, while visiting Panzi hospital, talks about Common Threads, healing, and CTP work in Democratic Republic of Congo. 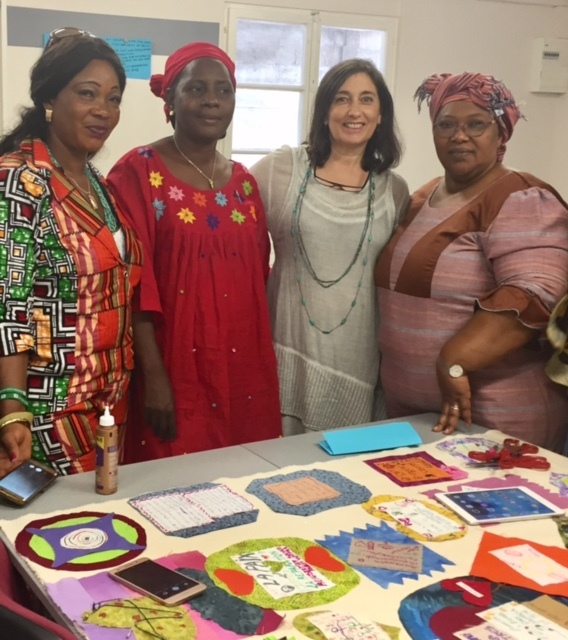 Geneva – A workshop with the Mukwege Foundation and co-facilitated by Common Threads Project helped bring together survivors to share their experiences, develop ideas, and create the fabric of a global network change-makers fighting to end sexual and gender-based violence. Watch a fantastic video from our partner, Dr. Denis Mukwege Foundation. The Dr. Denis Mukwege Foundation hosted a platform for survivors of SGBV from June 27th-30th, 2018, in Geneva, Switzerland. Geneva, September 2014 — Women gathered from 19 countries on five continents to attend the conference held at Webster University, Geneva from September 12 – 14, 2014. Textile artists, community activists, curators, human rights advocates, psychologists, art therapists, and archivists came together to share ideas and create a global network for work on story cloths. To commemorate the 16 days of global activism against gender based violence, an exhibition of the work of the women’s circles was held at a museum in Quito in Nov/Dec 2013. The participants attended the launch of the exhibition, spoke publicly about their experiences and advocated for prevention of SGBV. Cohen, Rachel. Common Threads: A Recovery Programme for Survivors of Gender Based Violence, Intervention (2013). Garlock, Lisa. Stories in the Cloth: Art Therapy and Narrative Textiles, Journal of the American Art Therapy Association (2016). The Courage to Fight Violence Against Women: March 2016, Washington D.C.